Interviews | Hey, How's Med School? Read this section in wiki for a primer on the Match. This week is Match Week. Well, technically, only Thursday, March 18 is Match Day, when US senior medical students find out where they will be spending their residency years. Yikes! I was telling Erika that it’s the culmination of all those hours of slaving over textbooks, the endpoint of all those board exams, and the reason for all the pre-dawn rectal exams I had to administer. So, yes, it is terrifying. Now, the probability that I was going to have to scramble was quite low, but the level of crappiness (not real term) associated with having to scramble into a residency program is so high that even the slight probability was more stressful to me than the real Match Day. Short, to the point, simple. Now that I know that I’ve matched, I am pretty calm about Match Day. I mean, I say this now. Ask me Wednesday night, when I’m trying to sleep. It’s gonna be another Benadryl night. I am almost done with my interviews for residency! I have just one left in the next week, and it’s at the program associated with my medical school. I’m hoping it’s less of a real interview day, and more of a gossip session. After all, all of my letters of recommendation come from this department. There’s not much else to say, if you’ve already said it all in your own letters. Instead, I bring to you, my obsessive organization and deep love for pie charts. Data analysis is the only way to make sense of a mad, mad world, don’t you think? Here’s a pie chart of the money I’ve spent during interview season. This total includes the costs of Setup, which was a new suit and three new shirts, and all the registration fees for applying to residency programs. I had two suits that I alternated between, one of which was a holdover from medical school interview season, 4 long years ago. I’m sad to say that though I still fit in it, it’s not looser — that was the goal. In return for med school sucking out my soul and making jam with it, I was supposed to become svelte and model-esque in stature. Once again, med school did not hold up its end of the bargain. My interview shoes (two pairs) were old shoes, though I did have to spring for new shoe inserts in one pair, as well as re-soling and polishing the other pair. My interview purse was a gift from my aunt (yay, Aunt M! ), and probably cost more than all my other clothing combined. Air travel includes only tickets for flights. In total, I flew 11 times through 10 airports, most of the time round-trip, but a couple of times with multiple city destinations as part of the interview trail. I never checked in a bag. I flew stand-by twice, to get on earlier flights. I got delayed 3 times, usually due to weather. I missed no flights (success!). I ate a lot of snack packs on Southwest, American Airlines, Alaska Airlines, and Virgin America. I did not fly Delta (the Devil Airline). I didn’t count the flights from school back to home, because I was going to have to make those flights anyway for the holidays. In all, I think $1045 (that includes tax) for 11 flights is a pretty good deal. Automobile is probably better described as ground transportation. For the most part, I rented cars after I figured out that a 24-hour car rental was usually cheaper than roundtrip airport shuttles. In some cities with great public transport, I took public transportation. In many cities, especially towards the end, I had made some good friends who were happy to give me a lift to the airport, or split a car rental. In return, I shuttled people to the airport whenever I could. For the most part, we were all really generous about giving our fellow interviewees rides to the airport. Big shout-out goes to Rachel, who picked me up from my hotel the night of our pre-interview dinner, dropped me back off after dinner, and then picked me up from my hotel again the next morning to go to the actual interview. That was above and beyond, man. Also a big thanks to Jess, with whom I had 5 interviews in a row, and when I gave her a ride from City 3 to City 4 (a 2-hour drive), chipped in money for gas. Hotel refers to when I had to book my own hotels. Some programs pay for hotels the night before, which is key. I have heard that certain programs can even pay for flight + hotel, which is disgustingly generous of them. I paid for 7 hotels, which averages out to less than $75 (including tax) per hotel stay. This category also refers to when I had to PAY for HOTEL PARKING, which I think is a total travesty. Most of the time, I tried to get street parking, because meter parking didn’t kick into effect until 8 AM the next morning, by which time I was long gone. My biggest feat was getting a downtown city center Courtyard Marriott for $45 pre-tax, and the hotel room was one of the nicest single rooms I’d been in. Or, maybe the Hyatt for $55 pre-tax, in a hotel room that included an adjoining sitting room and pull-out sofa. I did not include all the airport food I ate, simply because I was going to eat anyway, no matter where I was. I suppose airport food always costs more than non-airport food, but then again, I was usually getting dinners and breakfasts for free, so I think the cost of food evened out. I’ve also made a line graph of each of the interviews I’ve gone to, and how much money I’ve spent for each of them. The high spike for Interview #12 is a bit falsely elevated (source of error! ), because I got lazy and just lumped in the flight and car rental under Interview #12, even though the flight was also done for Interview #13, and the car rental was 26 hours longer because I insisted on staying the weekend with a friend, as a mini-vacation built into the trip. I don’t think the line graph is as telling as the pie chart. The only real findings I can see are that interviews with flights account for all of the spikes above $100. The two small spikes that are below $100 (Interviews #3 and #14) were due to driving to the vicinity in a car, and spending the night in a hotel. Interviews #6 through #11 were, interestingly enough, on two different coasts, but they straddled Christmas, and so I was able to use either my med school home or my parents’ home as home base. In a future entry, I’ll go through the different ways I saved money, from the art of priceline’s Name Your Own Price to rebate sites (I love you, ebates!). Oh shoot, I didn’t put in how much money I saved or made back via ebates and retail coupon codes. Nuts. Anyway, the grand total is $2,702, which I think is a pretty neat deal for having gone to 18 interviews. When I’m truly done, I will have gone to 19 interviews. NINETEEN! Most people I know have gone anywhere from 10 to 15 interviews. I’ve been interviewing since late October, and my last interview will be in February. I’m fairly certain I have the longest interview season out of all my classmates. I do have to say, though, that when I was using my parents’ home as my home base, all interviews that were drive-able distance were done using my brother’s car. And my brother’s car’s gas. I think that I would have to tack on another $100 for gas money, but hey, I didn’t pay for it. I met this guy who said that he’d spent about $15,000 for interviews and applications. $15,000. I boggled and couldn’t believe it, but then he told me about the foolish, foolish ways it had happened. He flew 5 separate trips from his home base (his medical school in New Orleans) to the West Coast. He took taxis. He booked hotels that the residency programs recommended (generally, these hotels are within walking distance to the hospital, and tend to be nicer places like Sheratons and Marriotts), and though he used the bulk rate negotiated by the hospital, it was still always more expensive than he would have found if he’d hunted a bit harder. He didn’t combine interviews, or “couldn’t combine interviews,” even though I definitely had interviews at some of the same places he did, and had combined them. I think he might not have been quite so dogged in combining interviews, though. Certainly, flying out of a smaller airport didn’t help the expenditures. He also counted the rent and living expenses he incurred while doing away rotations at other hospitals, which I didn’t really count. Let me backtrack about away rotations. As a 4th year med student, you are sometimes encouraged to go to other programs and do month-long “away” rotations at programs you might be interested in. The goal is to get a letter of recommendation and a foot in the door, because you’ve auditioned for a full month. This can fail horribly if you are a total jerk or are really awkward, lazy, or hopelessly stupid, because then the month proves to the program that they really wouldn’t want you, whereas if you hadn’t shown up at all they might still be ignorant of that fact when you sent your application. I did two away electives. During one of them, my sublet rent was $380 for the whole month, which is approximately 1/2 of what I pay back at school. While I was gone from school, I subletted out my own apartment, which, if you do the math, means I made money that month. Hahaha. During the other away elective, I imposed on the hospitality of my poor younger cousin and stayed with him instead of paying rent. I guess this guy who had ended up spending $15,000 counted the money he spent during his away rotations. I don’t think that’s entirely fair, though, because it’s not like he would have been not paying rent or not eating meals, even if he had stayed back at his medical school. Oh, perhaps I should add $300 to the grand total because I bought a netbook at the beginning of interview season expressly for travel use. Then again, this was a convenient excuse because since I bought my netbook, I have been using it more and more because my old laptop has decided to crap out on me, frequently and without warning. Well, interview season done for $3,000 is still a pretty neat trick, I think. Of course, I came home and Googled around until I found the image online. 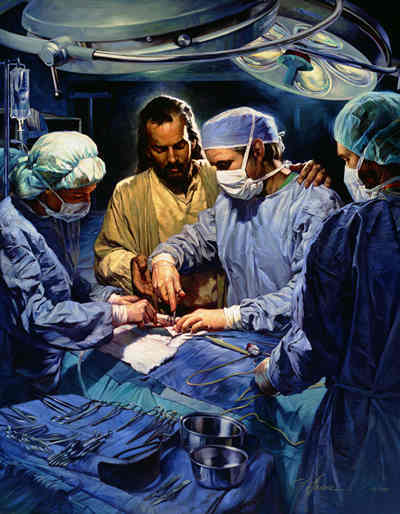 Imagine my surprise, when I found that the artist of this painting does a series of Jesus-in-healthcare-themed paintings! He’s not even wearing a face mask! Talk about a God complex. I’m worrying that even though I’m trying really hard to leave out identifying information about myself and the programs that I’m applying to, it’s not enough and still trackable back to me. For instance, I have notifications being sent to a real email address that I use for personal purposes. Paranoia dictates that I should have set up a separate email account specifically for this quasi-anonymous journal. Even more foolishly, the initial account for this journal used part of my name in it. I know the Internet isn’t anonymous, but I guess I had started out not minding people knowing who I am (after all, they were mostly stories about funny things my patients said/did/put up their butts or about exasperating things I saw happen in healthcare). But now that I’m interviewing and assuming that these programs are checking up on me, I’m on high alert. In addition, taking out so many details of the interviews and the program locations was making my write-ups more vague and less helpful than they were supposed to be. I actually started writing them in order to keep the programs straight in my head, but losing the details made the write-ups useless. I’m still writing them, but privately in a password-protected Word document (paranoid!). This program is very well known to me. And by very well known to me, I mean that it’s a residency program that is done in conjunction with my own medical school. In the med school slang, this is known as my “home program.” Well, technically, it’s not my real home program, because I did my rotation in this specialty in a different hospital with different residents, but still, it is affiliated with my medical school. This made parts of the interview harder, and parts of it easier. – Easier AND harder to explain why I wanted to go there — easier if the interviewer accepted my answer that I had been exposed to the program through my school, harder if that wasn’t good enough because any justifications I gave regarding the program’s characteristics had to be actually true and believable reasons. – Easier to keep a conversation going because we knew mutual people. – Harder to keep an interview going because it was essentially one-sided, with me asking questions because there weren’t many questions for them to ask me about my training. – Easier because the interviewers were apt to go easy on me, since I was part of the family, in a way. The interview day lasted 6 hours. In that time, I managed to be friendly with a couple of the other interviewees, and one of them was definitely a gay man. I swear to you, I don’t try to befriend the fabulous gays, but somehow they find me. It’s like I inadvertently smell of gayboynip, or something. This program is a university-based program. The interview day was pretty easy and relaxed, but there were a ton of people interviewing. For the most part, they were nice people and plenty friendly when we stayed on small talk topics (the weather, travel fiascos, medical school characteristics, sports teams). But when we went to lunch, I sat across from probably one of the more irritating types I’ve come across in medical school: the patronizing know-it-all. It’s hard to describe what about it annoys me, and how slight changes in tone or diction could probably make me like them better (or at least feel less homicidal towards them). Here is a prime example: we had Mexican food for lunch, and somebody mentioned that it seems like a lot of Mexican food is based on the same 4 ingredients wrapped slightly different ways, and cooked slightly differently. I remarked, “It’s variations on a theme!” But this Irritating Patronizer decided to school us on how that’s “fake” Mexican food. When the original commenter said, “Well, nothing wrong with that, because it’s still delicious,” the Irritating Patronizer persisted that real Mexican food is nothing like that, which may or may not be true. He never did list better examples of Mexican food, though I was doing it in my head (tamales! mole sauce! gorditas! masa!) Hilariously, somebody asked him if our lunch was “real” Mexican (people, stop encouraging him! ), and he said emphatically yes, this was very real Mexican food. You guys, our lunch was: refried beans, cheese enchiladas, beef taquitos, and chicken mini-chimichangas. At this point, I stopped even trying to join in, and spent the rest of lunch quietly smirking. Where was I going with this? Oh! The best part, though, is that we definitely learned in biochemistry class as 1st year medical students that most people, including Caucasians, have some level of lactose intolerance. I believe that only select populations of humans (Middle Eastern? North African? I am not sure) retain lactose-digesting enzymes past infancy, anyway. So, in theory, most people should not “like it, like it,” though many people say they do. Ironically, I’ve been trying to give up cheese and dairy, not at all because of any intolerance to lactose, but rather, for weight reasons. I legitimately eat enough cheese, and there are enough fat and calories in them (fat-free cheese is for wimps! ), that I can feel a difference when I cut it out and try to drop weight I’ve gained from stress-eating. Further, I read in some beauty magazine (written by white people about white people!) that cutting out dairy is good for the skin. And while I’m not sure of the validity of the claim, it’s a good side effect if it happens. However, I haven’t been particularly successful: this morning, I had coffee with milk. For lunch, I had cheese enchiladas. For dinner, I had a chicken sandwich with cheddar. I haven’t pooed all day, though. I wish I could tell Irritating Patronizer that right now, and stun him with my lactose-processing and -loving capabilities. A while ago, I went to my second residency inteview. 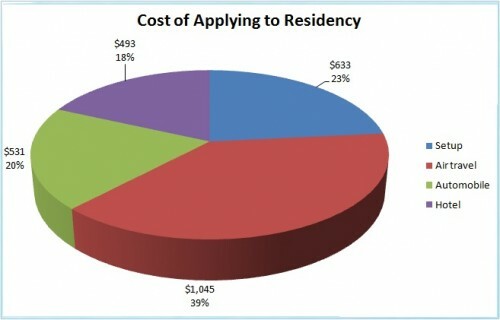 Residency Program B is a program at a private hospital at a medical school and university. I applied to it because it’s pretty well known and in the general area where I grew up. It’s also at a medical school with a large university hospital, which means it’s more academic than programs that are based only in a hospital. The things I really liked about the program were its location, and how much the residents seemed to like being there. There were quite a few of them who had gone to the medical school and stayed on to become surgery residents there. To be honest, I think that’s one of the best indications of a program — these are people who know the truly bad parts, and they still want to stay. I’m a little bit concerned, though, because the majority of the residency graduates end up in private or community practice, and at this point in my life, I’m not so sure I want to do that. It’s possible that the reason I think I want to stay in academia is that it’s all that I’ve known. It means that I have to keep more options open when I’m evaluating programs. The city and the area around the hospital are… way out there. The residents kept saying that they’re an hour from Big City, but I cannot be fooled! We’re talking at least an hour and 20 minutes, without traffic, to the east side of this Big City. Uh, add traffic and possibly needing to get to the west side, and I’m pretty sure that’s like a 3-4 hour drive. Haha. Lies! The people are are my people! It was so easy to talk to them, and we definitely were on the same wavelength. Unlike the residents at Residency Program A, I didn’t feel like I had to stretch to make conversation. That was nice. I think this program is not as academic as other programs where I will be interviewing, but certainly is academic enough for my purposes. The people seem great. I think I would legitimately be happy here, and end up getting a great education. It’s not as flashy as other programs, but then again, I’m not very flashy, either. I’ll probably rank it higher than Residency Program A, at least. So, today was my first residency interview. I am thinking of keeping track of these interviews and program characteristics here, because we don’t rank programs until February, and I doubt I’ll be able to keep these programs straight without some sort of log. I should develop some sort of systematic way, I think. Uh, where was I? Oh, right, rank list and Match. When it comes to the Match, it’s not like applying to college, where you get acceptances and you just pick one of the colleges before a certain date to commit yourself to. When it comes to the Match, you rank all the programs where you applied, and the magical mathematical algorithm matches you with just one program and assigns you to it. And wham, that’s it. I mean, that’s not always it, because you could not match and have to participate in the Scramble, but I choose not to think about that right now because it’s an alarming thought that I don’t need to worry about. Residency Program A is a program at a private, non-profit hospital somewhere in the Mountain time zone. I applied to it originally because I’ve always had a fascination with the area, and I thought I should check it out. Also, Residency Program A is purportedly in the 6th largest city in the United States (though I think it’s an exaggeration), so it’s urban without being one of the big three (which I consider to be LA, NY, and Chicago. Maybe DC? San Francisco? Whatever.). After taking this course in college, I thought I really wanted to live in a second city, which is an urban development that has all the benefits of a larger city without so many of the problems (sprawl, ridiculous prices for living actually downtown, crime). These are the reasons why I applied to the program. The program is fairly academic without being completely devoted to churning out academic physicians. The mentality is to do research and to publish, but I didn’t sense that there was a publish-or-perish mentality, nor did I think that it was frowned upon to end up as a community surgeon. This would probably be helpful in keeping more avenues open for me, in case I started off wanting to do community and ended up becoming academic (though the reverse is probably more likely at this point). The program is unique in what I’ve seen in that the teaching is done in an apprenticeship manner — generally one resident to one attending. Other surgery programs (in fact, all the surgery programs that I’ve seen) involve larger teams consisting of a chief resident, senior resident, and junior resident running the team and answering to the attending physician. 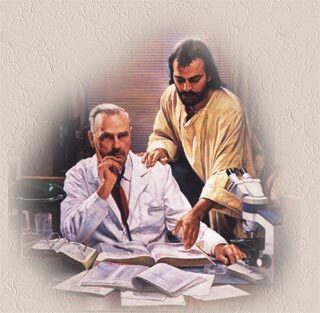 I wonder if being one-on-one with the attending can be lonely, without other residents around to be part of your team. The thing I really liked about the program setup was the chief year. At other programs, the chief residents are the team leaders of certain services. At this program, the chief residents were treated more like junior faculty members. They had their own clinics, their own patients, and ran their own surgeries with only minimal supervision by senior faculty. I think this would be a great asset as a graduate, because I will have been essentially running my own practice for a year by the time I graduate and actually start practicing on my own. There are some rotations that are done at off-site hospitals, including all of the pediatric months. Clinics are usually at the hospital. – The hospital is very new and very nice. I think the institution is financially secure, so I wouldn’t have to worry about the place losing accreditation or its funding for residency education. – The support staff and the ancillary services seem awesome. No drawing my own labs or wheeling my patients down to get x-rays. – Call schedule seems pretty manageable and, dare I say, easy, especially compared to other programs out there. There are programs out there where call is q3, which means every 3rd day. For example, if I were on call on Monday, I would stay in the hospital all day and night on Monday, go home Tuesday around noon, come back Wednesday morning and work a regular day, and be on call again on Thursday. Lather, rinse, repeat, cry. They were talking about q6 call for interns. That sounds like vacation to me. 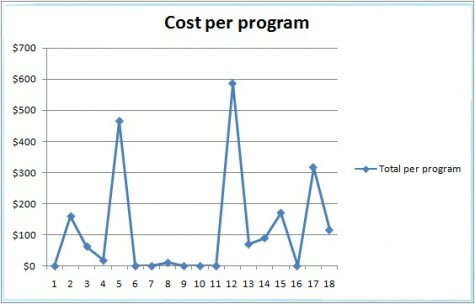 – The program is pretty small. They take 3 residents per year. I think they could take 1 more and still be okay, but I think they’re not interested. The hospital is an easy flight from Southern California (my criterion for “easy flight” = anything shorter than 5 hours; admittedly low standards). This isn’t a huge deciding factor, but being able to pop back to see my family for a weekend would be great. Oh, and the program has a slightly different weekend schedule, where you get actual weekends, as in Saturday and Sunday are not spent in the hospital at all, about 3 out of 4 weekends a month. The flipside of that is, though, that a weekend call lasts from Friday night to early Monday morning. Ouch. Wow, that town is white. Very white. There was 1 other Asian person interviewing on my day, and one girl who looked half Asian. Two and a half Asians out of 11, which I guess is representative of the Asians in the general populace. I guess. I have to say, that my first impression of the house staff (= residents), the patients, the faculty, and the general population around Residency Program A’s city was, “…But it’s so WHITE.” Nothing against white people, but… I’m not white. And I’d like the city I live in to at least somewhat reflect the person I am. Oh, that reminds me. I need to Google around to see if there is a 99 Ranch or something nearby. ALSO, just a tip: It’s “99 Ranch,” not “Ranch 99.” When you want to impress your friends with your Chinese people know-how, at least say our market right. If you really want to impress, learn it in Chinese. It’s not hard to say, actually. It’s not at quite as big or as academic a program as I’d imagined myself training in, but then again, my assumptions about what I want might be totally off. I can’t help thinking that going to a program that is somewhere closer to being community than academic, at a posh hospital with insured old white people as my primary patient population is kind of like… putting myself out to pasture. Before age 30. I mean, I like taking old lady walks and going to bed kind of retardedly early, but still. A line must be drawn! And it’s so white. In a sentence, I would say that I like the program and how it’s structured, that the institution is well-regarded, and I would end up being a very good physician out of it. But I have some reservations about how well I would fit in with the rest of the crew and the surrounding location. I would be going there for the program, and not for the surroundings. Despite it being my first interview and not having seen other places yet, I think it will end up somewhere in the middle, when I eventually rank.